International Construction and Architecture Fair BUDMA attracted crowds of visitors. Among the exhibitors, there could be found an impressive MODULO Parking stand. During the four-day Fair on 30,000 square meters, nearly 1,000 companies from 33 countries around the world presented themselves. The program was full of debates, seminars and demonstrations of equipment and machines. – For us it was an extremely fruitful time – says president Projprzem Makrum S.A. Piotr Szczeblewski. – Our sales representatives have had dozens of meetings with clients, including also guests from abroad. MODULO, another year in a row won the prize for the stand presented at the Fair, which design referred to the futuristic concept of parking systems. In the central place was the SCISSOR system. – Preparations for each Fair take actually a few months – says the Coordinator of the Marketing and PR Department of the IMMOBILE Capital Group Adam Chojnowski. The biggest responsibility lies with people who look after the MODULO brand. You have to think about all the details, like all materials printed in several language versions, gadgets, planning the transport, loading and unloading of the parking platform that we present on the stand. During the Fair, we always present one or two parking systems. 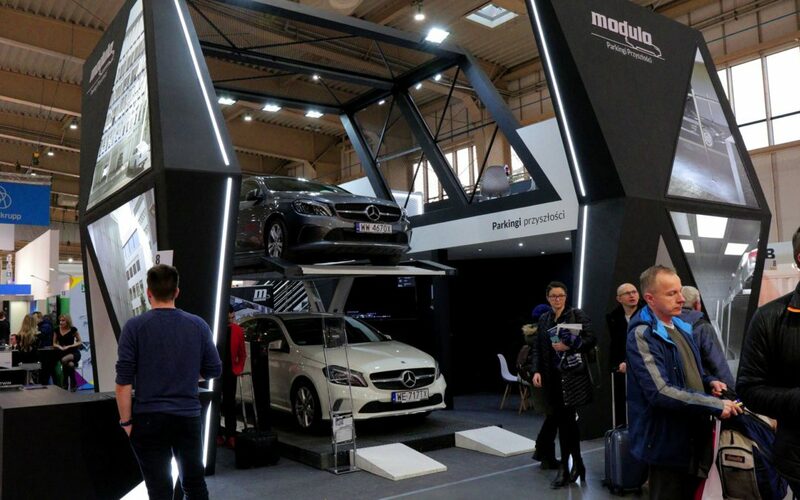 Our goal is that everyone who visit our stand, in addition to get acquainted with the folders or brochures, could see the “heart” of MODULO: the parking platform. And what does the Trade Fair look like from the “commercial” side? 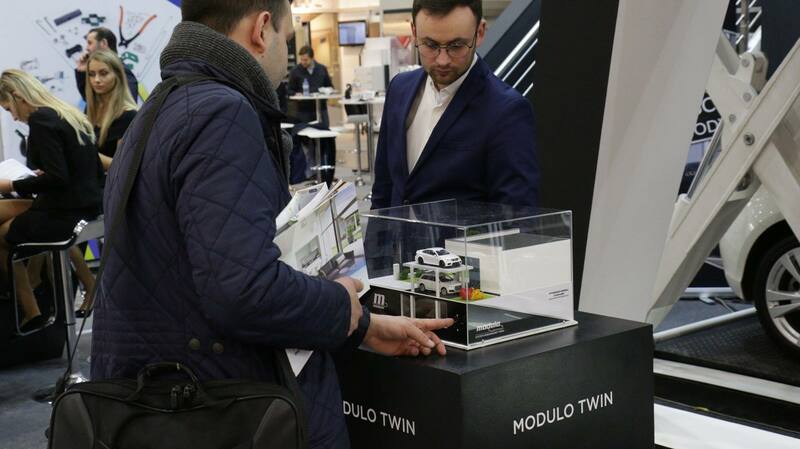 – We have held hundreds of conversations in Poznan – says MODULO sales representative Martin Szargan. – Some people asked very specific, “technical” questions. 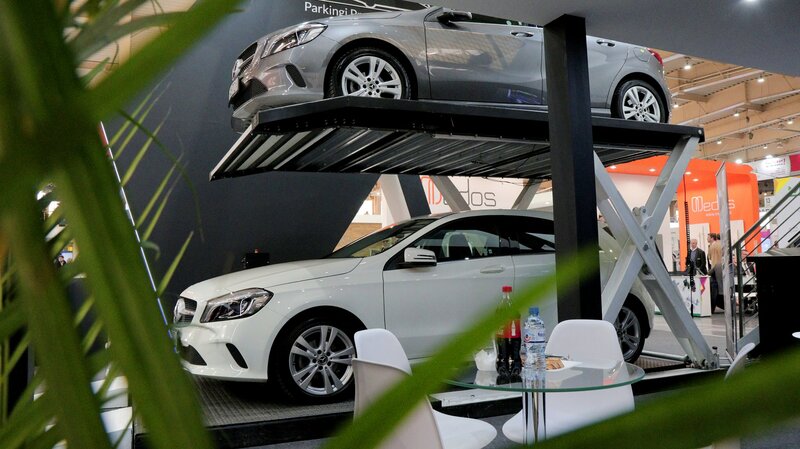 Others just wanted to see our modern parking platforms. And the amount of business cards distributed during the Fair is really difficult to count … – he adds.Visitors at our stand often asked about MODULO’s latest projects, especially those in Poznań and abroad. We had also chance to present our plans for the future. Nowadays, we are usually “online”. In the global web, we can find all the necessary information about the product we are interested in: a detailed description of the operation, photos or videos. The fair is the best opportunity to meet the customer directly, to hold a conversation and exchange insights. It’s time to sit down, close the laptop and speak directly, face to face. – I value the fair for the opportunity to meet people. After several minutes of talking, it turns out how much we have in common – says Martin Szargan. – Oh, you’re from Bydgoszcz! I was there once at a sport event. – I spent half an hour searching for a parking space. Such systems should be in every city! – Recently I visited a colleague who moved into a new apartment and showed me these “machines” in the garage hall! And from BUDMA, like from any trade show, we brought, above all, a lot of energy for further action. Thank you.